The tiny mountain town of Marble is the home of a quarry that has provided marble for the Lincoln Memorial in Washington, the Tomb of the Unknowns at Arlington National Cemetery in Virginia, and hundreds of other buildings. The town, located 40 miles south of Glenwood Springs, has become a summer tourist destination because of the quarry and a handful of historic sites, including two houses, a bank building, a church, a high school and the town hall, all wood frame structures built as the quarry boomed between 1906 and 1917. Visitors can walk through the remains of a historic marble finishing mill, where marble pillars still stand 20 feet high. The pillars supported an overhead crane as the quarry was booming in 1913. The mill was destroyed by a snowslide in 1912 but rebuilt and then was heavily damaged by fire in 1925. Scattered on the ground nearby are pieces of solid granite that are larger than cars. They likely were rejected before shipment to building projects because of imperfections in the marble. The town also is the site of the Marble Sculpting Symposium in which participants spend eight days carving three cubic feet of Yule Marble that was quarried 50 to 90 years ago and taking workshops to improve their carving skills and develop their artistic abilities. The quarry, which operates year-round, is the world’s only source of Yule Marble, which is almost pure calcite and rivals the quality of Greek and Roman marble from classic times. It is more expensive than other varieties but is valued for the smooth texture, consistent look and luminous surface. Other notable buildings that feature Yule Marble include the landmark Equitable Building in New York City and the San Francisco City Hall. In Denver, the marble was used inside the State Capitol, on the exterior of the Cheesman Pavilion, and on the interior and exterior of the U.S. Customs Building. The marble is excavated from a mine inside Treasure Mountain at 9,300 feet in altitude. The marble deposit runs 239 feet thick in the Leadville limestone formation, though perhaps only the top 100 feet is marble of top quality. The availability of large blocks of marble drew architect Henry Bacon to select it to clad the entire exterior of the Lincoln Memorial, which stacked a dozen 35-ton blocks to form each column on the front of the memorial. The deposit was discovered by Sylvester Richardson while prospecting for gold or silver in 1873, and it was rediscovered a year later by prospector George Yule, for whom it was named. A series of efforts to develop a quarry failed, including one begun in 1892 by coal baron John Cleveland Osgood, founder of nearby Redstone, that ended when he ran into financial troubles. However, Osgood’s operation did provide marble for the interior of the Colorado State Capitol in 1895. Regular production began in 1906, after industrialist Channing Meek, a former partner of Osgood in the Colorado Fuel & Iron Co., raised $3 million to acquire the quarry and develop it. Meek built the world’s largest marble fabricating mill at the site and arranged for the extension of a rail line to Marble. The quarry’s first major contract was for $500,000 to deliver marble for the Cuyahoga County Court House in Cleveland in 1907. By 1910, the quarry was generating millions of dollars a year in revenues for Meek’s Colorado-Yule Marble Co., and the town had reached a population of about 800. In 1913, the quarry landed its first $1 million contract with a deal to provide marble for the Equitable Building. The quarry, however, faced financial troubles because of its high operating costs and heavy debt from the expansion that Meek had engineered. The company also lost Meek in 1912, when he died from injuries suffered when he jumped from a runaway tram coming down from the quarry. The Colorado-Yule Marble Co. was awarded the $1,080,000 contract for the Lincoln Memorial in 1914, and the town’s population peaked at 1,500, with three hotels, a movie theater, an ice cream parlor, two newspapers, five ice houses and nine stables. Production at the quarry collapsed in 1917 as the last stone was placed at the Lincoln Memorial and World War I began. The quarry went bankrupt but was reopened, though it struggled financially despite getting a boost in 1931, when Yule Marble was chosen for the Tomb of the Unknowns. The quarry closed in 1941, and key equipment was sold for scrap to aid the war effort. 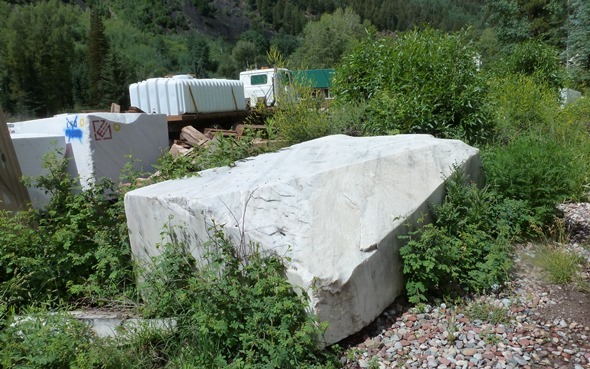 The quarry has recovered since its 2004 acquisition by the Canadian stone company Polycor, which operated it as Colorado Stone Quarries Inc. and marketed the Yule Marble in the United States and Europe. The Red Graniti Co. of Italy acquired the company in 2013 and ships the marble to Cararra, Italy, for processing and then sells it in the United States, Europe and Asia. Hikers used to be able to climb to the top of the quarry on a hillside littered with large blocks of marble rejected from earlier projects, but that trail was closed for safety reasons as the quarry resumed production. The Lincoln Memorial’s standards were so high that the quarry was taking out 80,000 cubic feet of marble in order to ship 12,000 to 15,000 cubic feet of finished material. County: Gunnison County (Gunnison is county seat).